A people's assembly in Sarajevo. Demotix/Aurore Belot. All rights reserved. Transition was meant to be a process ending in accession to the European Union. But now the EU itself seems to be a project without a clear direction and whose prospects are uncertain: continuing austerity measures, multiple “crises”, from economic to institutional ones, rising unemployment rates, especially among the youth, and growing right-wing extremism in Greece, France or Hungary. In accordance with Thatcherite ideals, the European welfare state is now almost completely dismantled, labour laws are regressing to the early years of the twentieth century, and public services have been gradually privatised. The political regimes in the Balkans have been following this general European trend with similar disastrous results. However, today in many Balkan states these regimes are for the first time facing a serious resistance coming directly from the street. These new social movements reflect a need for a deep transformation of Balkan societies. Given the multi-faceted situation described above, it is unsurprising that the movements differ in their methods of struggle, their ideological orientations and their strategies. They are mostly a reaction to the deteriorating social and economic situation and numerous abuses of power by corrupt political elites. Nonetheless, they often serve as hubs for new ideas and more proactive projects offering a progressive vision of their societies. In this article we will sketch a typology of these movements and actions by dividing them into five main blocs: anti-regime protests, mobilisations for the commons, student movements, workers’ struggles and, last but not least, hegemonic cultural and intellectual efforts. Since the outbreak of the financial crisis in 2008, anti-regime protests have been erupting regularly across the Balkans. In Croatia in Spring 2011, for a whole month, up to 10,000 people were marching across Zagreb every evening denouncing the political system and all political parties. In Slovenia in 2012 and 2013 general “uprisings” mobilised the whole country, contributing to the fall of the right-wing government and a number of corrupt officials. In Bulgaria in spring 2013 huge protests triggered by drastically increased electricity bills brought thousands to the streets only to be followed after the general elections by even larger protests in summer 2013. For weeks masses protested against political elites and their ties to the powerful mafia and media moguls. In Romania protests have been sporadically erupting since 2010, in response to unbearable social conditions and continuing austerity measures. Similar types of protests, with different intensity, have been seen also in Serbia, Macedonia, Montenegro, Kosovo and Albania. However, probably the most important social upheaval in the post-socialist Balkans started in Bosnia and Herzegovina this February. It was preceded in June 2013 by massive demonstrations whose initial aim was to put pressure on politicians to resolve the issue of citizens’ registration numbers – exploited like many other things in this country by nationalist politicians – and then turned into general anti-elite protests across all communities and all sub-state units. These protests soon waned. But, on 5 February 2014, only eight months later, workers from several privatised and destroyed factories united in the streets of Tuzla to demand their unpaid salaries and pensions. Soon, they were joined by students and other citizens from all walks of life. Clashes with the police resulted in burning government buildings in Tuzla, which was replicated in other cities such as Mostar, Zenica and Sarajevo. And while the media and political class were denouncing “hooliganism” and “vandalism”, the protesters were busy establishing “plenums”, self-governed citizens’ assemblies that spread throughout the country, from Tuzla itself where the first plenum was formed, to the capital Sarajevo, regional centres such as Mostar and Zenica, and to smaller cities such as Bugojno, Bihać, Brčko, Travnik etc. Most canton governments resigned and cantons’ assemblies mostly accepted — the implementation remains another issue — the main demands by the plenums. After long deliberations open to all citizens, almost uniformly, with some regional variety, they demanded the revision of the privatisations, the end of excessive politicians’ benefits, and new governments filled with people with proven expertise and no record of corruption. All these examples — and the Bosnian one especially — show that for the first time we have more than an anti-government rhetoric per se – instead there is a true anti-regime sentiment. Not only the state but the whole apparatus on which the current oligarchy is based is called into question by (sometimes chaotically) self-organised citizens. The emergence and nature of these protests invites us to rethink the categories used to explain the social, political and economic situation in the Balkans, and elsewhere in post-socialist eastern Europe. It also compels us to understand the nature not only of state institutions, their weakness or failure, but the nature of the post-socialist regime that has been (almost) cemented over the last two decades but susceptible to crack under the weight of its own contradictions and products such as, for instance, rampant poverty. Rebelling against these regimes is all that much harder because they often do not have a single face, no dictator, no governing families and are not characterised by open repression and censorship. These occasional expressions of anger are indeed the seeds of a new political and social dynamics that might result in wider movements. However, they are also characterised by volatility and by random triggers, and are usually followed by confusing and often contradictory political messages. 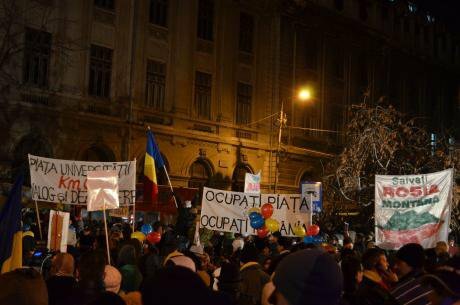 Protests in Bucharest against the Rosia Montana mining project. Demotix/Alexandru Alexe. All rights reserved. Examples are abundant: The Right to the City movement in 2009/2010 in Zagreb mobilised thousands in defence of a square in downtown Zagreb; in Dubrovnik citizens organised to defend a nearby hill from being turned into a golf resort; in Bosnia’s second largest city, Banja Luka, citizens tried to defend one of the few public parks; in Belgrade smaller mobilisations were triggered by cutting down old trees in one of the main streets, so as to obtain more parking space, or by destruction of a neighbourhood park; in Bulgaria in 2012 people demonstrated against the privatisation of forests; in Romania in 2012 against the privatisation of emergency services, and again against an ecologically disastrous gold mine project in Rosia Montana etc. These single-issue movements proved to be channels of general public dissatisfaction and enjoyed support from the vast majority of citizens who see privatisations of the commons or neglect of public interest as intolerable practices. The commercialisation of public education, what many see as the ultimate common and social good, triggered massive student mobilisations as well. Since 2009, strong student movements have developed in Slovenia, Croatia, Serbia, and to a certain extent in Bosnia-Herzegovina, Montenegro and, recently, Kosovo. While students mostly protest in classic ways in Bosnia-Herzegovina, Montenegro and Kosovo (marches, protests and petitions), in Slovenia, Serbia and, especially, in Croatia the student movement extensively experiments with occupations and direct democracy. It is precisely the emergence of plenums within these movements to which we can trace the current Bosnian practices of direct and horizontal democracy. In this context, it is worth paying special attention to the Croatian case, where an independent student movement articulated a strong resistance to the privatisation and commercialisation of higher education. Their protest against neoliberal reforms in the field of education turned into probably the first strong political opposition not only to the government, but indeed to the general political and social regime. During 35 days in spring and two weeks in autumn in 2009, more than 20 universities all over Croatia were occupied with students practically running them. In itself, nothing new one could say, but the way they occupied and ran the universities deserves our attention for its originality in a much larger context than that of the Balkans or eastern Europe. They invited to their plenums not only students but all citizens to debate issues of public importance such as education and, in addition to that, to decide upon the course of the protest movement. 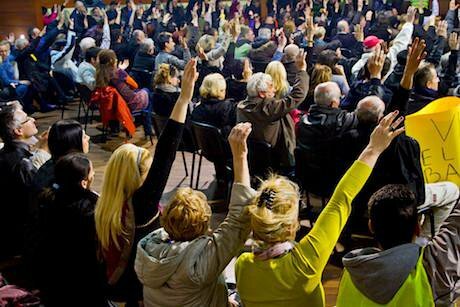 The most active plenum at the Faculty of Humanities and Social Sciences in Zagreb each evening gathered up to 1000 individuals deliberating on the course of action. This event gave rise to a movement for direct democracy which was seen as a necessary corrective of electoral democracy and partitocracy and, possibly, a true alternative to it. The new Croatian Left, whose ideas quickly spread around the post-Yugoslav space, do not see direct democracy as limited to the referendum practice but rather as a means of political organisation for citizens from local communes to the national level. This horizontal model has been used since then by many collective actions across post-Yugoslav space, from Occupy movements to street marches, workers’ strikes, and farmers’ protests, and, finally, on a larger scale, by protestors in Bosnia-Herzegovina. The recent period is also marked by reinvigorated workers’ struggles. They are not uniform, and range from classic strikes, workers’ influence in running companies in majority state ownership and defending them from further privatisations (the Petrokemija factory in Croatia), to examples of successful and unsuccessful takeovers by workers (e.g. Jadrankamen and TDZ in Croatia) and the models of workers’ share-holdership (Jugoremedija in Serbia and ITAS in Croatia). We are also witnessing a new cooperation between different social movements (such as students and workers) in building a common anti-capitalist strategy. Finally, there is another type of struggle that deserves our attention: namely, hegemonic cultural and intellectual efforts whose aim is to change the general public climate, dominant media discourses, and re-introduce progressive ideas into wider society. Its primary goal is to undermine the (neo)liberal hegemony that since 1989 has successfully delegitimised left traditions and promoted electoral democracy—although often ending up in autocracies—and the free market as the only game in town. In the post-Yugoslav context, this general post-socialist orientation was coupled, not always harmoniously, with nationalist-conservative, right-wing extremist and anti-communist dominance. It clashed though with liberal attempts at “democratising” these societies; the efforts focused mostly on institutional reforms and an EU integration process that only problematised criminal privatisations and practices—but not the general neoliberal orientation. 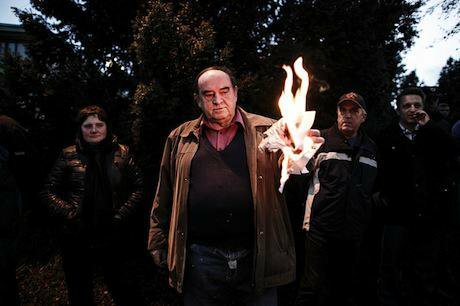 An anti-government protester burns a sign in Kranj, Slovenia. Demotix/Luka Dakskobler. All rights reserved. Until recently, introducing a progressive agenda and radical thinking into the dominant discourse was an almost impossible task. However, the 2008 economic and financial shock, followed by the crisis of the EU, opened a space for until then marginal movements to articulate their critique of the current political and economic regime. These attempts range from public gatherings, forums and festivals (such as the Mayday school in Ljubljana, the Subversive Festival in Zagreb or Open University in Sarajevo), summer schools, a series of activist and academic workshops and conferences to newspapers, reviews and online magazines (from Zarez and Le Monde Diplomatique in Croatia to CriticAtac and LeftEast in Romania, or Mladina in Ljubljana). The political strategies of the movements described above remain for now confined to occasional protests and occupations — often marked by the questioning of representative democracy in the name of horizontality — petitions and even referendum initiatives. Although the model offered by Greek left party Syriza, a coalition of movements engaged in parliamentary politics, is widely appreciated, we cannot so far detect any serious attempt at taking these struggles towards institutional politics. Nonetheless, what the current protests in Bosnia and Herzegovina clearly show is that protest energy can soon vanish and turn into an even bigger despair as well as the usual fragmentation, or what Walter Benjamin called, “left melancholy”. But, if protests turn into some sort of institutionalised politics — whether in the form of self-created parallel institutions such as citizens-led assemblies and/or new political parties that are ready to take on electoral struggles — the progressive movements’ potential for a wider social and political impact can remain strong. Without the protests, the plenums would lose their potential to apply pressure, and without the plenums, the protests would lose their legitimacy and articulation. In turn, any future attempt at party and representative politics will have to be based on, inspired and guided by social movements and their plenum activities. The current wave of protests and plenums in Bosnia and Herzegovina may thus represent the birth of a true activist citizenship, and the profound politicisation of a society over the most fundamental questions for any country, namely social justice and equality for all its citizens. What happens in Bosnia, will not stay only in Bosnia. This article first appeared in the web magazine Citizenship in Southeast Europe. It is based on the introduction to the forthcoming edited volume “Welcome to the Desert of Post-Socialism: Radical Politics after Yugoslavia”, edited by Srećko Horvat and Igor Štiks, London: Verso, Autumn 2014.